This is great, but it does pose problems in that it's often difficult to work out the best way to reach someone. You might have separate buddy lists for Skype, Google Talk, Yahoo!, MSN, and Facebook, and constantly logging in, launching apps and finding your online pals can be a real chore. fring is designed to change all that, providing you with a single platform, based on your mobile, where all of your online friends are available in one place. 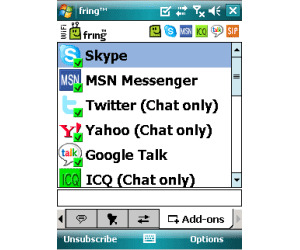 fring supports most of the major chat services including Skype, MSN Messenger, Google Talk, ICQ, Yahoo!, and AIM. You can also use the program to check Facebook updates, view Twitter feeds, and even listen to music with friends on Last.fm. fring is simple to install and set up. Once you've registered for a fring account you can import your online contacts very easily. You just go to the 'Add-ons' section, click a service you want to access (e.g. Skype, Yahoo!) and sign in using your normal log-in for that account. The contacts are automatically pulled into fring and displayed in the main window, and you can quickly view who is online and who isn't. Not only can you chat via instant messages but fring also lets you make cheap or free calls to your buddies via SkypeOut/SkypeIn. This means you can ring people from your phone's contacts locally or internationally, at vastly reduced rates. Of course, you'll need to be in a WiFi hotspot for this to be of any benefit but thankfully, fring comes with a tool for automatically logging you into your favorite hotspots. There are a few extra chat features of note within fring, such as file transfer and a history view. However, its functionality is still vastly inferior to what you'd expect from most of the chat services themselves. For instance, there are no emoticons, games, video conferencing, etc.